Nazi Chic Is A Thing In Thailand. 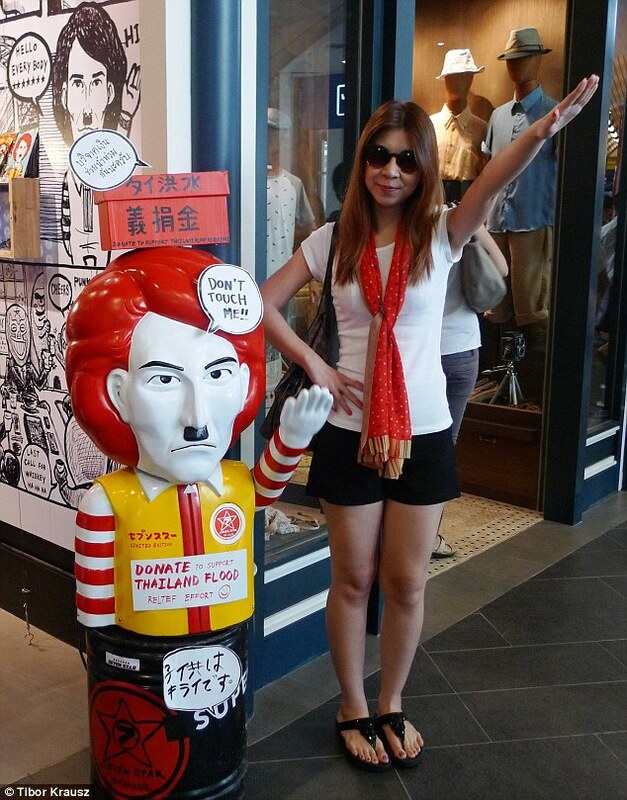 Posted on March 5, 2012 by Big Red	in WTF Booty and tagged HILTER, NAZI CHIC, RONALD MCDONALD, THAILAND, THAILAND NAZI CHIC CRAZE, the daily mail. There’s a certain craze sweeping through Thailand at present and it’s at it’s strongest with teenagers in the country, it’s called Nazi Chic. As a character – a character like Mickey Mouse, Napoleon, or Hello Kitty – Hitler is a very distinctive one, with that scowl, caterpillar moustache, and hairlick. And he’s not just a grinning nonentity type character like Mickey or Hello Kitty – he has a presence. This character is well known worldwide, and moreover is not copyrighted. This new Thai fashion just piggybacks off that. They have not had it drummed into them from birth that Hitler was the worst man in the world, worse than the devil; they really know rather little about him. Also the Thai view of the world is not dualistic, dividing the whole universe into black and white. They understand that there is good and bad mixed in every impermanent thing. That’s why they see nothing wrong with using the image. A bit like the way we see Napoleon today – yet in the nineteenth century he was the devil incarnate. For more pictures and info on the story chart a course for HERE. ← Assassin’s Creed Screenshots Confirm The Rumours – The English Are The Enemy.